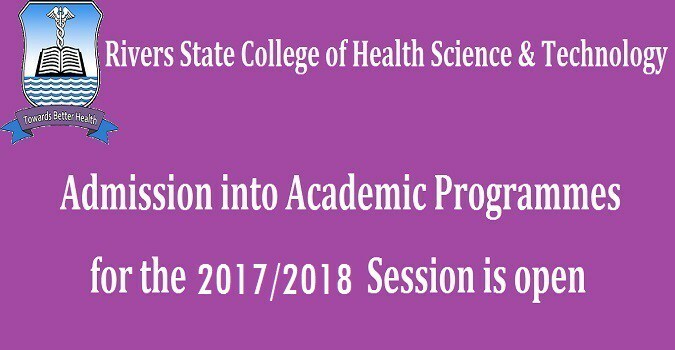 Applications are invited from suitably qualified candidates for admission into the Rivers State College of Health Science and Technology (RSCHST) various Diploma Programmes for the 2017/2018 academic session. 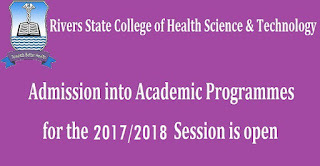 RIVERS STATE COLLEGE OF HEALTH SCIENCE AND TECHNOLOGY AVAILABLE PROGRAMMES. RIVERS STATE COLLEGE OF HEALTH SCIENCE AND TECHNOLOGY ADMISSION REQUIREMENTS. Be sure you choose a course you are passionate about and will really enjoy. Applicants who are awaiting O’level results need not apply. Applicants must be 16 years of age and above by September 2017. Application for change of course will not be considered in view of limited admission spaces. Admission into College’s certificate programmes is based on the candidate’s success in the entrance examination conducted by the College, in addition to possession of stipulated entry requirements. HOW TO APPLY FOR RIVERS STATE COLLEGE OF HEALTH SCIENCE AND TECHNOLOGY ADMISSION. Applicants should seek advice from the Admissions Officer or the ICT Unit if the on-line application process is unclear to them. Applicants should ensure that their entries are properly checked, before clicking on SUBMIT; as they may not be able to make any corrections thereafter. Please bring the Identification slip with you to the examination centre. ENTRANCE EXAMINATION: Shortlisted applicants will be subjected to an entrance examination. Entrance Exam Date To Be Announced in Due Course. The exam is designed to evaluate candidates in order determine how ready they are for College-level work. STRUCTURE OF THE ENTRANCE EXAMINATION: The Entrance Examination will last for two hours and shall consist of multiple choice questions, which shall be based on the following O’ Level subjects: English Language, Mathematics, General Science, Social Studies and General Knowledge. Candidates are advised to conduct themselves in a proper and orderly manner during the examination. Candidates are reminded that the Examination Malpractice Act 2004 provides penalties for persons convicted of examination malpractice. Therefore any acts of examination malpractice should be avoided. Candidates stand to be automatically disqualified in the event of impersonation, disturbances at examination halls, failure to obey lawful orders of supervisors/invigilators, forgery of Identification Slip. Applicants should note that admission to the College is highly competitive due to limited places. Therefore, it has become necessary for the College to adopt standards that are much more demanding than the minimum requirements. To gain admission into the College, applicants must attain an acceptable pass level in the entrance examination, in addition to possessing the required entry grades and other entry requirements spelt out by the respected school/programme to which admission is sought. Pls don’t hesitate to share this Information across to others via our sharing buttons below & also feel free to comment, we appreciate comments.